Peter Shergold was asked to find lessons for public servants from failures under the previous government. He seized the opportunity to launch a manifesto for public service transformation through “adaptive government”. When Peter Shergold was asked to rake over major policy failures under the previous government and draw out lessons in better ways of doing public administration, he seized the opportunity to say what he really thinks. 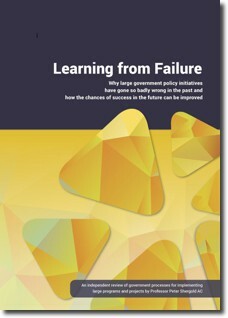 His lively report (with its mouthful title) — Learning from Failure: why government policy initiatives have gone so badly wrong in the past and how the chances of success in the future can be improved — reads like a manifesto for modern public services that attempts to go well above and beyond its terms of reference. To enable this bravery, Shergold argues that the Freedom of Information Act should be amended to make all “advice and opinion provided to support the deliberative processes of government policy formulation” off limits to the public. He also wants the Australian Public Service Commission to direct that all “significant advice” be provided in writing, for secretaries to be accountable for the “quality” of their advice, and a new record keeping policy to explain obligations around official records clearly. He lists 28 recommendations in total, many of which could be described as quite radical for the APS. The report, sent to Environment Minister Greg Hunt last August and published by the APSC on Friday, was well received by Commonwealth secretaries. They are keen to respond to its call to arms, a source involved with the project told The Mandarin. While Learning from Failure goes back over the findings of inquiries initiated by the current government into mistakes made under its predecessor, as requested, Shergold does not see the issues exposed as unique to those programs. Instead, the former head of the APS and former public service commissioner decided to pull together what he has learned in the eight years since he left the bureaucracy to pursue a portfolio career, and set out a coherent and unequivocal platform to transform public administration. The University of Western Sydney chancellor has worked as an academic, a non-executive director on boards of various companies and not-for-profit organisations, and most recently as the New South Wales co-ordinator general for refugee resettlement. Agility through looser organisational structures. Shergold made it abundantly clear, lest he be misinterpreted, that he does not believe “public administration runs a poor second to private enterprise” or “that senior public servants are inferior to business executives” as other commentators regularly assert. “It seems to me that the vocation of public service is extraordinarily demanding and I am delighted that it continues to attract high quality graduates with commitment, dedication, intellect and capacity,” he said, arguing that “poor investment decisions, failed IT projects, unwise ambitions [and] lack of foresight” were equally common in the private sector. Digressing further, he said the public sector was better when it came to giving women fair opportunities to serve on boards and leadership teams, and that big private sector companies resembled government departments structurally. The key difference, of course, is competition, which forces even the biggest companies with seemingly unassailable market share to adapt or die — and the same goes for not-for-profits. It is competition that makes the other two sectors more innovative, more flexible, more adaptable and more agile, the APS elder argued; the way to improve the public sector is by bringing all three together. “Public services have a problem; there’s a problem in the way in which governments traditionally deliver programs,” Shergold said in his Friday presentation. That problem is service delivery increasingly being handed to contracted providers, but the public service refusing to let go of the apron strings. “There’s a problem in the manner in which the contracts that are written constrain the outsourced providers, prescribing in amazing and stupid detail how they should operate,” he said. He believes accountability mechanisms like audits and reporting should focus on performance against desired policy outcomes, agreed with government. Public servants need to “design the metrics for whether those outcomes are being delivered [and] allow flexibility in how they are delivered”. But he warned that departments need to collect the right data and develop new capabilities in forecasting what would happen in the absence of a particular program, in order to evaluate whether the outcomes are being met. Businesses generally do not try to transform operations on a large scale all at once, said the former top mandarin. Based on his experience on corporate and not-for-profit boards in recent years, he says Cabinet needs to first work out its risk appetite, and then authorise small scale trials to test out new approaches, with successful programs scaled up quickly. “Imagine how it might be different if we’d done that with the home insulation program, [or] the NBN,” he said. Shergold believes the public generally accepts experimentation as a legitimate approach, and said NSW premier Mike Baird has been successful in selling the idea. He endorsed the Silicon Valley mantra that says if you fail, it is best to fail quickly and try something else. Public servants will remain “at the heart” of the situation, a bridge between government and the rest of society, said Shergold. He said that public administration should be evidence-based “but more importantly, it needs to be creatively re-imagined — in part by looking outside the public sector environment”. Making it easier for people to “enter the public service and work on particular projects that engage them, and then leave again” would be helpful — what he referred to as the “Hollywood model” of working, where each film project brings together a different crew for a limited period of time. “A lot of the work that public servants do lends itself to that,” said Shergold. He said public servants should also be able to work outside the public sector, and that contacted providers needed to be allowed to co-design new approaches. “Let citizens, through the extraordinary potential of digital democracy, have the power to influence decisions,” he added. To remain relevant, Shergold thinks public sector organisations need ” the leadership of facilitation” instead of “the leadership of control”. It’s one of Malcom Turnbull’s favourite buzzwords, but Shergold’s explanation of agility was far more concrete than most: flatter, looser management structures. The “dampening effect of vertical hierarchies” that see notes to ministers go through long approval chains would also have to be mitigated, he added. “I’m sure it does at the margins improve things at the cost of three weeks’ time but they do need to see there are costs to that,” Shergold told the small audience. “We need to see there are costs to hierarchies in the way they dampen down creativity and imagination. The old structures need to give way to a “culture of discussion, debate and challenge, which actively encourages new ways of thinking” so those new ideas can be trialled and “used to transform the core of public service” if they are successful.